Derek R. Taylor was born in 1933 in Kensington-on-Thames, England to Richard and Clara Taylor. The family, which also included a sister, Rene, immigrated to Rolling Hills, Alberta in May 1948 and eventually bought a farm. Derek attended grades 11 and 12 in Brooks and worked for the Royal Bank of Canada. In 1952, he married Grace McClelland of Brooks and the couple had five children, Gary, Debbie, Diane, Robert, and Pamela. Derek worked in the oil patch on a seismic crew and for his father on the farm. He returned to the University of Alberta in 1952-53 for further education. At the completion of his training, he taught school in Patricia and Rolling Hills. The Taylor family moved to Grande Prairie in 1958 with Derek becoming the first vice-principal of Swanavon School. In September 1959, he was transferred to Hillside School, becoming its first principal in January 1960. Later in his career, he taught English and Social Studies at the Grande Prairie High School and was assistant superintendent of the district starting in 1966. 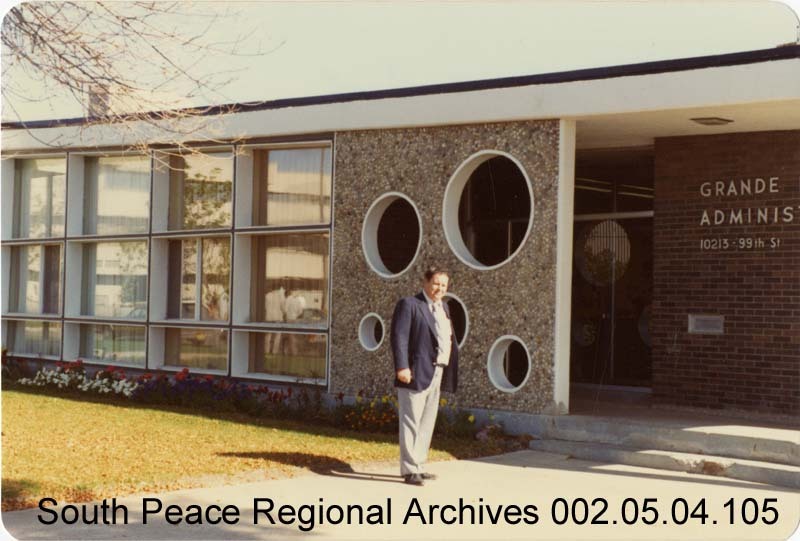 From 1969 to 1995, Derek was the superintendent of the Grande Prairie Public School District No. 2357, which made him one of Alberta’s longest-serving superintendents. One of his greatest achievements as superintendent was the creation of Crystal Park School, with integrated classes. Derek also taught a course for Grande Prairie Regional College’s education department. Following his retirement from the School District, Derek entered civic politics as a Grande Prairie City Councillor and served three terms, from 1995-2003, during which time he was chairman of the airport commission (1998-2001) and the council representative on the library board (2001-2003). Derek Taylor also served in the militia, including as an aide de camp for the lieutenant governor, as master of ceremonies at a Royal Visit luncheon in 1987, as president of the Grande Prairie Golf and Country Club from 1990-1991, and as a Justice of the Peace. Derek R. Taylor died in Grande Prairie in 2003 at the age of 70. Sources: SPRA finding aid (190), Herald Tribune February 28, 1983, May 13, 1987, February 15, 1995, December 1-3, 2003, Grande Prairie Capitol of the Peace, Rolling Hills in Retrospect, http://www.discoverthepeacecountry.com/htmlpages/grandeprairie_news2003.html, Derek Taylor Public School 2013-14 brochure, list of Elected Officials of the Community of Grande Prairie from 1914 to Present.